It’s our third day here in Phnom Penh and we are digging it pretty much. The food scene is not disappointing at all especially when it comes to International cuisines. There’s no shortage of choices on food in the Riverfront area. Prices are very reasonable as well. My friend Eddie from Malaysia who invited me to Phnom Penh will be arriving today. He is quite familiar with Phnom Penh after few years of traveling back and forth because of his business commitments. We are quite excited about the prospect of having a personal tour guide to show us around. Upon his arrival, he brought us to the Riverfront area and will introduce us to the most famous Cambodian cuisine call Amok. 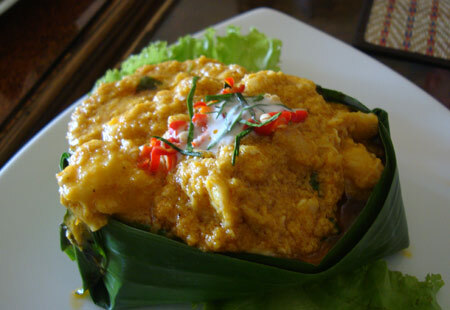 Every country has a national dish and for Cambodia, Amok is the most famous one. We ordered Fish Amok and when it arrived, I had a feeling that it will taste good by just looking at it. The presentation of the food look good and the color of the sauce is very appealing. The name Amok most likely represents the method of cooking certain meats and vegetables. I came up with this conclusion after browsing through the menu and noticed that the restaurant also has chicken, beef and vegetables cook in Amok style. We decided to order Fish Amok as it is the most popular choice among other meats. It is cook in certain curry spices and what made it different from other curry dishes from other countries, it uses egg white to thicken the sauce. I’m not sure our Amok has coconut milk in it, and even if it has coconut milk like Thai curries, the flavor of coconut milk wasn’t that strong. It uses fish fillet ( much to the delight of our Caucasian friend ) and I’m guessing it is fresh water fish. It is wrapped with banana leaf, most likely to give an extra fragrant to the dish. In my opinion, the taste is really good and it is really appetizing when it is served with hot fluffy rice. It kinda tasted like a certain Nyonya dish that is famous in Malaysia. We ordered another salad dish known as Khmer Char Kdout Salad. 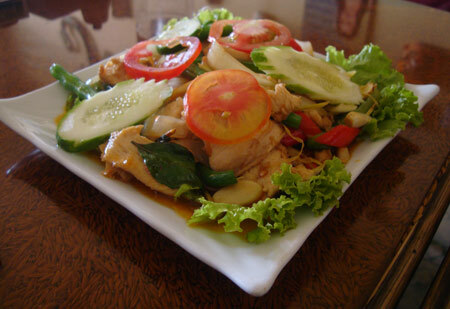 It is a slightly stir fry chicken fillet marinated with spices like lemon grass and among others. It also has chili, cucumber, green pepper, onion, beans and lettuce. It doesn’t have the sweet and sour taste along with spiciness like Thai papaya salad. The salad does taste good but it doesn’t provide me with the “WOW” effect. This does not mean it doesn’t taste good. I will eat this anytime of the day if given the choice between fast food ( ehem…McDo ) and this chicken salad dish. Since there are 3 of us, we ordered another beef dish. 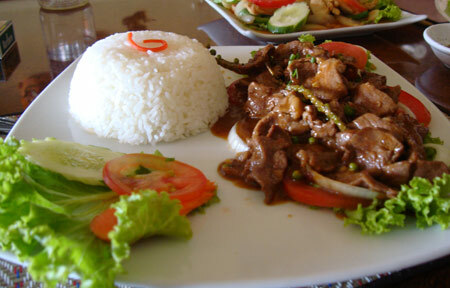 It is known as the Khmer Beef Loc Lak. It is a stir fry dish with beef fillet with special Kampot pepper sauce. I think Kampot must be an area in Cambodia famous for it’s production of pepper. I think the all of us agreed that this is our favorite dish among the 3. Most likely it is because we are meat eaters but this doesn’t mean Amok is not fit to be the famous national dish of Cambodia. What made this Beef Loc Lak even more appetizing is the dipping sauce. I’ve seen many sauces around Asia but this is the first time I’ve seen sauce being prepared this way. It is simple yet tasty. It is just a combination of pepper and salt soaked with lime juice. 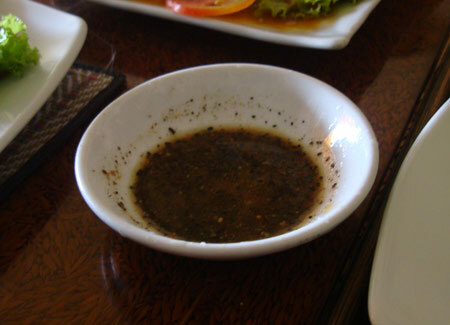 I think this dipping sauce can go well with any stir fry meat dish. Or even BBQ or grilled seafoods and meats. Since the 3 of us loves spicy food, we added crushed bird’s eye chili to give it and extra taste of “OOMMPHHH”. In my personal opinion, most of us are more familiar with Thai food. Since Cambodia is a neighboring country and the culture is pretty similar in our eyes ( clueless foreigners ), we tend to expect the taste of Cambodian cuisine just like Thai cuisine. I’ve heard comments from tourist that Cambodian cuisine is the bad version of Thai food. I think this is wrong as it is totally a different cuisine of it’s own class. I actually wanted to ask the chef or even the waitresses more about Cambodian cuisine. I decided to drop the idea as I’m not a very confident person in real life. Maybe the chef might be busy, not as friendly as we expect him to be and thousand of other reasons I could think of just to deter me from getting more information. Worst scenario is being laughed at and labeled as an Anthony Bourdain wannabe, hahahahaha. I need to grow a pair of b@@ls and get the courage to do all this. Maybe I will be more confident if my blog grows bigger in the near future.